2018 EDITION UPDATED and REVISED. In the best-selling What Makes Your Brain Happy And Why You Should Do The Opposite, science writer David DiSalvo delves into six decades of research to explain why our brains are perilously prone to bias and delusion. 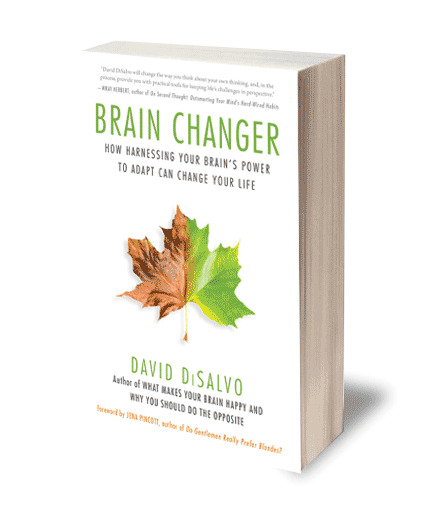 In Brain Changer, DiSalvo reveals the game-changing solutions that brain science is beginning to offer and how we can apply them in our lives. "DiSalvo will change the way you think about thinking." Is There a Connection Between Lack of Sleep and Loneliness? What Connects Altruists and Psychopaths: An Interview with Dr. Abigail Marsh, Author of "The Fear Factor"